I read some books this year. Check them out. Though not a published book, I’m also counting my friend Joe’s adult fiction manuscript because it was wonderful, and is currently in search of an agent. So, 60 books! Yay! If I like an author, I will immediately read everything else they’ve written (or illustrated, in regards to graphic novelists). Speaking of, this was the year of graphic novels for me. And, not surprisingly, YA books. For the library, I’m on the summer reading booklist committee, so I have to read a bunch to see what might be a great fit for our list. Thus, quite a few listed. I might not have read them on my own, so I’m glad I was asked to check them out. And that led to my newfound love of coming-of-age graphic novels. It’s really neat looking at my list and seeing friends on it (hi, Panera crew). And books my agent represents. And books my editor edited. So proud! All said, my adult reading was very light this year. Whoops? 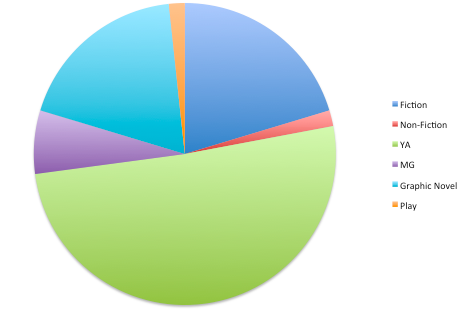 I wondered what my ratio was, so I’ve decided to make a pie chart for my 2013 reads. Observe! I guess to make up for this, the two books i’m currently reading are both non-fiction. I’m happy to say that i’ve enjoyed all books read this year. Some I absolutely adored and will remain top books in my heart for a while. And now, I look forward to what 2014 will bring! What were your reading habits for 2013? Read anything great that you think I should check out? Let me know – I love recommendations! “Delirium” and “Pandemonium” (although, I am sure I am late to the party on those. I thought the first one was good but not too crazy about the second so I never read further. I think she also wrote Before I Fall which is supposed to be good. Ex-Heroes which was kind of interesting. The Cuckoo’s Calling was good but … I didn’t *love* it and I found the ending a little predictable. Ender’s Game. I found it enjoyable. The Swerve, which I found interesting for about the first half maybe. I think I also read Sin in the Second City and Thunderstruck. I liked both of those. I don’t know that I enjoyed many of the other books I read this year. Re: Delirium & Pandemonium – not too late to the party! The finale, Requiem, just came out this year (on my list, actually). I’d say finish the series to see how it goes. I enjoyed it all, though I liked Before I Fall better. I’m just a contemporary fan, I guess. I’d like to read Cuckoo’s Calling, too. AND Sin in the Second City. That one looks fascinating (I love the time period).